Today's Formula One British Grand Prix was an absolute mess, especially when compared with the relative tameness of the Canadian Grand Prix and the Monaco Grand Prix. This race wasn't about the failure of the drivers to maintain the racing line, this race was about the failure of one thing – the tires. That sentiment was looming over the entire race. The race started out normal enough, what with Mark Webber being knocked down to 15th place after being sideswiped on the first corner and suffering front wing damage. That sort of thing always happens though, so it didn't seem like it was too much to worry about. Lewis Hamilton led the race in his home Grand Prix out of the gate, and it looked like it was going to be a sunny and splendid Sunday. Then came lap eight. Hamilton was heading down the Wellington straight at Silverstone when all of a sudden his left rear tire absolutely exploded, as if by dynamite. Video replay showed that the tire actually slowly disintegrated for a few seconds before completely letting go, and Hamilton's sharp reflexes were pretty much the only thing from sending him flying off the track. The British home favorite managed to nurse his car all the way back to the pit lane on only three wheels, but it was a warning of things to come. Two laps after that, Felipe Massa's left-rear tire exploded. Massa had a complete blowout and couldn't hold it together as Hamilton did. Pirelli began checking their product. The drivers were told to stay off the kerbs (advice which few heeded), as pit crews frantically checked left-rear tires for damage, with both Sebastien Vettel and Mark Webber hearing over the radio that cuts were found in their previously used tires. If you haven't been watching F1 long, it's rare for a driver to say they were afraid of anything. Pirelli, for their part, has said that the tire failures are a result of "something new," though they're not saying what it is yet. The whole thing has shades of the 2005 United States Grand Prix, where Michelin advised its seven customer teams that its tires would not be safe after witnessing Ralf Schumacher have a spectacular blowout in practice. With all of the tragedies that motorsport has suffered as of late, reader McChiken116 put it well when he said that things are getting very, very scary. No word yet on whether anything will change, though. When asked after the race whether or not he was going to be speaking to Pirelli, Lewis Hamilton replied with "it's a waste of time talking to them." For what it's worth, the race actually did have a bit of a thrilling finish. Sebastian Vettel was forced to retire towards the end (eliciting cheers from the crowd), his first since the Italian Grand Prix of last year, when gearbox problems ended his race. It was a rare reliability problem for Red Bull, and somebody will probably be executed for it. Mark Webber stormed back from his 15th place spot, even setting the fastest lap of the race on the very last lap to take second place. 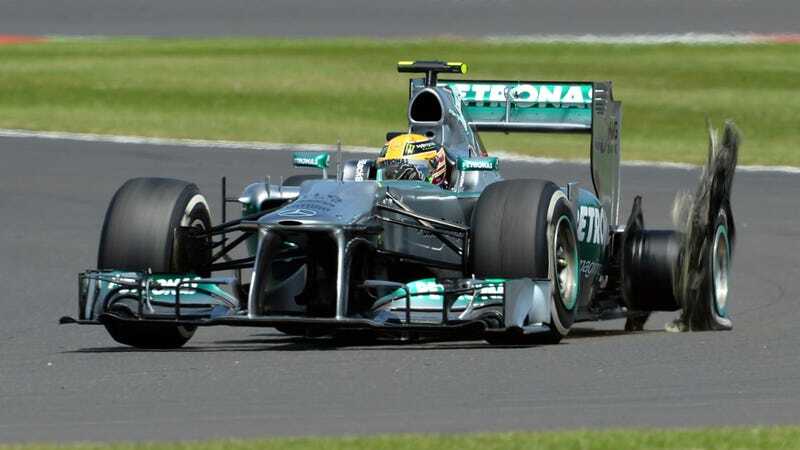 Given one more lap, he might have overtaken race winner Nico Rosberg. Even though he may be on the out, he still hasn't lost his touch. Provisional race results are below.